It’s been busy around here what with garden tours, garden parties, garden visits and garden workshops, not to mention the garden itself! Recently I was out in the early morning garden, rushing to accomplish some task before “they” arrived. As I sped through the garden intent on accomplishment, my large swath of Lady’s Mantle, still dressed in its early morning dew, beckoned to me. It was so beautiful I stopped what I was doing, returned to the house, removed my gardening boots, gloves and knee pads, and went inside to get my camera. I then treated myself to a leisurely stroll around the garden to enjoy the fruits of my labors. I’m glad I did. It’s so important to remember to stop and enjoy for ourselves what we have made beautiful. I plant Lady’s Mantle in every garden I tend. I love the stories of how it got its name. 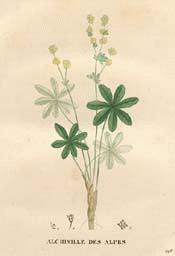 It was first called Lady’s Mantle in the 16th Century by a German botanist, Jerome Bock. Linneaus himself adopted the name and used it, insuring it’s continuation. One common story is that the pleated, scalloped edges of the plant resemble a medieval lady’s mantle, one suitable to clothe the Virgin Mary herself. This is why the name is singular, Lady’s, and not the plural, Ladies’, mantle. Another story is that the scientific properties of the plant are known to stop bleeding and have been used throughout history to treat menstrual bleeding, causing it to be known as Lady’s Mantle. I plant it as a talisman. Any plant associated with protecting and caring for women is welcome in my garden. 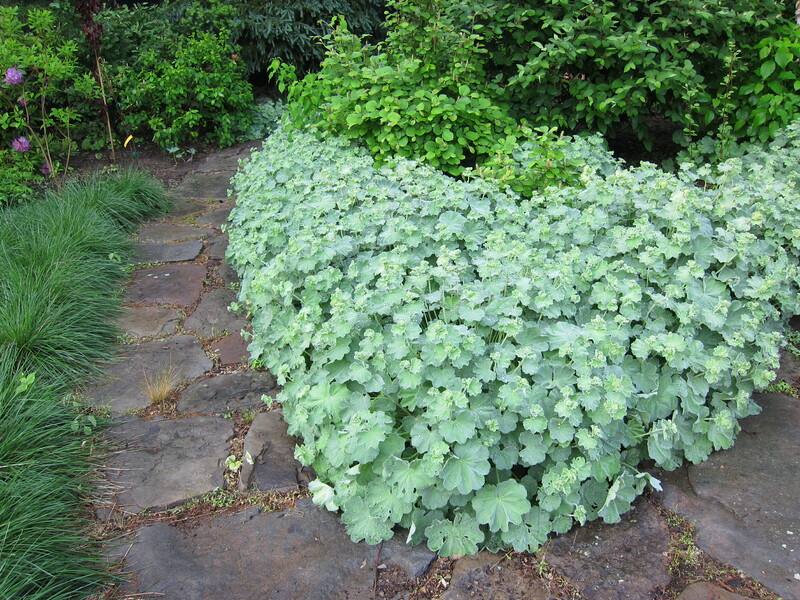 The recent day when my planting of Lady’s Mantle called to me to slow down and pause, and enjoy the garden, it protected me. I was working myself into a frenzy of preparation but, after seeing the Lady’s Mantle covered in dew I knew that before long the dew would evaporate and if I wanted to enjoy the sight, I had to do it NOW. From there I looked around at the other beauty in the garden and was content that yes, it is not perfect, but it is beautiful. I was able to relax and enjoy what I had created. When “they” arrived, they too found beauty and enjoyed what I had created. 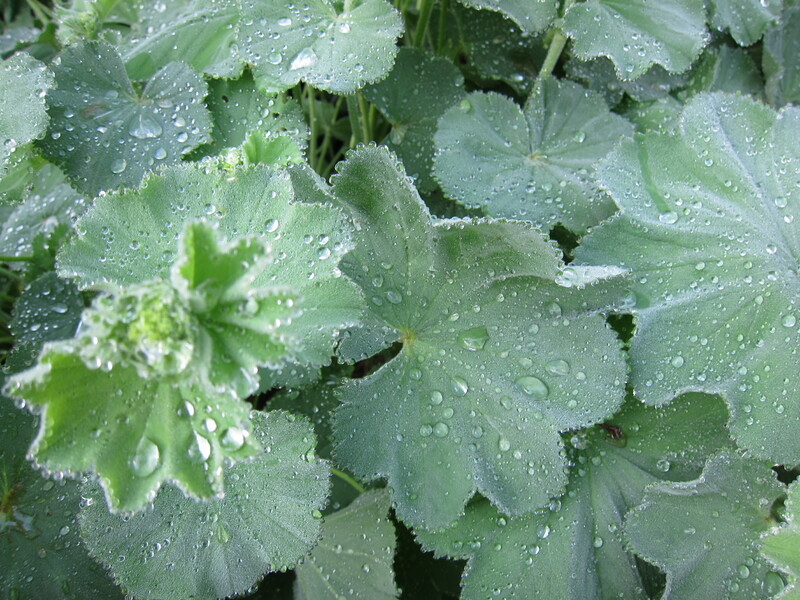 I have lots of Lady’s Mantle in my garden, too, and I love the pleated new leaves and the look of raindrops or dew on its velvet leaves. I have a daily ritual for making sure that I take time to enjoy the garden. After I go for my morning walk and shower and dress, but before I start the work of the day, I do the following: I make a pot of tea and pour the first mug, then I take that outdoors with me, along with a basket I use for deadheads, and I walk slowly through the garden. I always take the same route, pausing along the way to deadhead, to pay attention to new buds, and just to pause and enjoy what is happening in the garden. When my morning “tour” is complete, I pour another mug of tea, and take it and my breakfast out into the garden to just sit and drink in the beauty for 20-30 minutes while I eat. Then I’m ready to get down to serious work. What a lovely ritual. I, too, like an early morning stroll in my garden with a cup of tea. Perhaps this is how all days should begin. Love the dewy photo, and all plants that are girl powered! Yes, indeed YOU GROW GIRL!